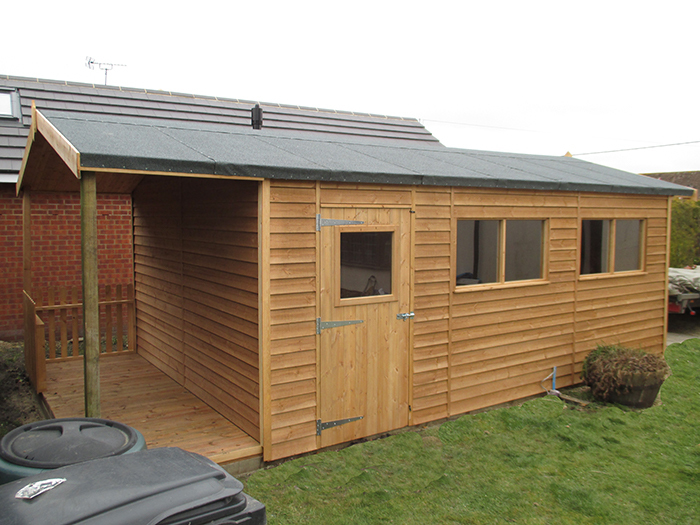 This functional Garage was recently installed for a customer based in Wantage, Oxfordshire. The garage is entirely handcrafted using only FSC® certified timber and has been coated with our preservative stain in Light Oak shade which not only looks appealing but also protects against fungus and woodworm. The customer worked with our experts and designers to add a custom overhang and veranda which provides a convenient space to use for barbequing, storing bins or even as a log pile. Internally, the building enjoys natural light thanks to 5 fixed windows along the length of the garage, as well as double door access in the gable end not shown in the image. 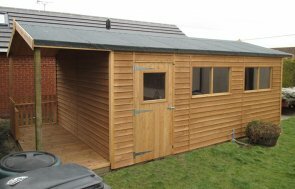 The garage measures a total of 3.6 x 5.4m meaning that there is plenty of internal space. The site was also perfectly prepared for the installation of the garage with the customer opting for one of our building bases. Just wanted to let you know that I am absolutely delighted with my garden room; the entire process from delivery, erection and internal finishing went smoothly and quickly due to your hard working team, with the unexpected good weather a bonus! The final result is so pleasing I'm now considering a matching garage! 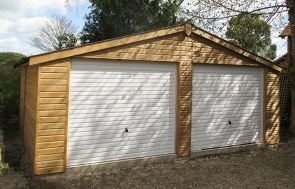 To view our entire collection of Garages, you can take a look at our extensive website or alternatively, pay us a visit at your nearest showsite. If you’d like to speak to one of our friendly experts, you can also get in touch with us!